The Tulle Box – Run by powerhouse Chrystal who has been building her business since first launching in 2006 on Etsy. She has her own workspace with 2 employees. Chrystal inspires us to not focus on the end result but on the journey. She reminds us to lend a hand and help inspire those around us that are also on this journey as we can all help each other out, and to never lose hope. Taylor Elliott Designs – Run by Taylor who has a passion for product design. She reminds us to be open to new ideas and ways of doing things. To truly celebrate your successes and to always have a to-do list. Loll-Le-Gaggin – Such a cute name for this company run by Brenda & Lisa who look like sisters! These girls are a fun duo who design jewelry. They remind you to stay focused and all the important aspects associated with staying focused. The Tulle Box white board – They made this adorable white board, it’s a perfect size for my office to be sure I write down my goals and inspirational quotes to get me motivated. The Tulle Box coasters – I like the design on these, they look like a fancy mason jar and are great to keep my handcrafted coffee table looking new. Loll-Le-Gaggin necklace – This is a really nice quality necklace to keep you grounded and motivated. Loll-Le-Gaggin leather bracelet – Really funky wristlet! 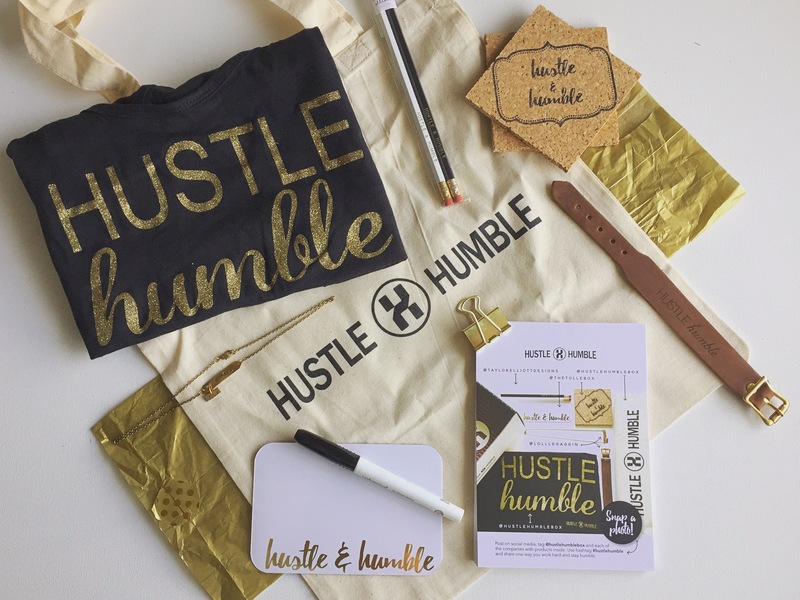 HustleHumbleBox tote – can never have too many totes! HustleHumbleBox tee – Not really my style but cute for working out! Tons of inspirational material, ideas and quotes to keep you on track with your business! Each box delivers curated products that are meant to inspire and encourage connections whether it be companies or individuals. Be sure to utilize your resources and find out how you can help others move their business forward as well.